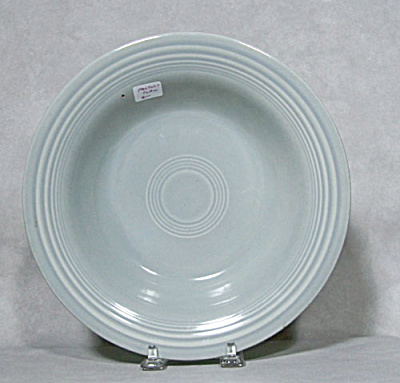 This example is in the gray color which was one of the 1950 colors of the line It was made continuously from 1950 until discontinued in 1959. Also often called a "soup plate" or a "rimmed soup", it is a 8 inch diameter plate with a deep well and used for serving soup. It is in very good vintage condition with very light use. There is a glaze pop on the inside rim which was created in the firing of the piece at the factory. These 1950s Fiesta colors are getting harder to find. Add it to your Homer Laughlin or vintage Fiesta collection today.